Want to expand your brand presence in a fun way, create an awesome fundraiser for your school or nonprofit, or add a revenue stream to your retail storefront? 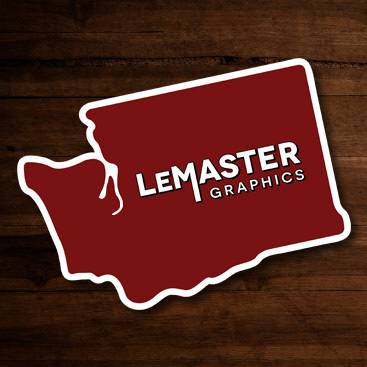 LeMaster Graphics is here to help with custom stickers! Our custom stickers and vinyl transfer decals make for a great revenue stream that takes up very little shelf space – and our branded stickers are a great way to turn your customers’ cars, laptops, water bottles, et cetera into mini-billboards for your brand! 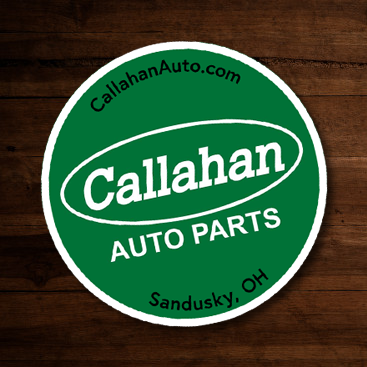 Sell stickers at the full MSRP to add to your sales, or sell logo stickers at or near cost to encourage your customers to show off your brand. These also make for awesome freebies to give away with large purchases or as prizes for contests at your location or on social media! These are great for restaurants, bars, breweries, sports teams, coffee shops, or any sort of brand that your loyal customers are excited to show off. We offer low minimum order quantities (minimum 50 stickers per order), generous wholesale discounts, and free digital mockups before you order. Check out our styles below or contact LeMaster Graphics with any questions regarding custom orders! Your logo on a peel-and-stick sticker! Can be any shape/size. Price depends on sticker size; contact LeMaster Graphics to get a custom price quote within one business day. Your logo on a 3″ round sticker! We can add your website, location, or any other info to the top and bottom while still keeping a clean, simple design. Jump on the travel-sticker trend with these 5″ wide Oval Travel Stickers! Add your city’s name or abbreviation (max. 6 letters) in large letters in the center. Your business name can be added upon request (sample shown above) or we can keep it unbranded. Show your local pride with your logo on a custom state-shaped sticker! All 50 U.S. states are available, please contact us for a custom mockup. Great for local businesses, schools, and sports teams! This design takes your local presence further and shows a heart over your city or region. Just like our state design, these can be done with any U.S. state and in any colors. Contact us for a free mockup design with your state, colors, and logo! Pay tribute to the heroes in our police force (Thin Blue Line), military (Thin Green Line) or Fire Department (Thin Red Line). These can be done with any of the 50 U.S. states, or with a full outline of the United States. 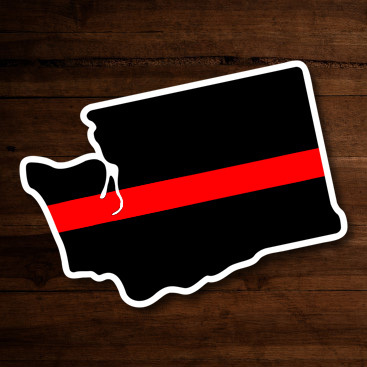 A portion of the proceeds of all Thin Line sticker orders will be donated to an appropriate nonprofit. We’ve all seen the huge “retro” trend that’s going on right now. Here in Washington, you can go to a Mariners game and see thousands of people wearing vintage-looking blue and gold Mariners gear… colors the team hasn’t used since 1992. Well, other than the tradition of wearing vintage blue and gold every Sunday, which started in 2015. The Mariners team store in Seattle is stocked with gear with the classic gold trident logo, a logo that the team officially “retired” in 1986. It’s gotten to the point where the Tampa Bay Rays, a Major League Baseball team established in 1998, recently designed a 1970s-style logo just for the sake of offering “retro” gear to the fans… in addition to selling gear with their original 1990’s logo as well. If you’re ordering logo stickers for a school, a coffee shop, a brewery, et cetera, and have an old logo that you haven’t used in years, bring it back as a retro design! We’ll place it on a retro-style sticker with a colored backdrop and funky retro-style lettering, and will even optimize the logo into high print resolution (300 dots-per-inch) at no extra cost with your sticker order. When you request your quote and submit your logo, please mention that you would like your sticker done in the retro style.